Supposing you have a website for your small business set up, or you're in the middle of building one. You've probably considered adding a blog to your website, but may well have rejected the idea. People I talk to are often loath to start a blog, understandably wary of the time that needs to be put into it. But it doesn't need to be that painful, and whatever field you're in, it’s likely that you could benefit greatly from starting a blog. Here are some reasons why I'm a massive advocate of adding a blog to your website - whatever it is that you're doing. Google prefers sites that have more content over ones that don’t. The content has to be relevant - a blog is perfect. Google also likes sites that are updated often - again, blog posts directly related to your subject matter are ideal. Writing about your subject matter educates your readers. For example, if you run a hypnotherapy or an acupuncture business (as in two of the examples below), your potential clients could feel a little hesitant about booking an appointment with you. Your blog articles could tell them what to expect in a session and give them some information about hynoptherapy which will reassure them. The same goes for many other types of business, specially ones which offer treatments. If you have your own content on your blog, it gives you something to post to social media. And if you're not using social media to promote your website, I think you're missing out in a big way. A blog is a way of appealing to your target market. If you show you understand their problems and offer answers, it’s likely that they’ll choose to come to you over one of your competitors. Your blog can reinforce your unique selling point, and introduce the readership to your values, your philosophy and your company style. It can engage readers on a human level. People prefer to do business with people they like. This is your chance to have your prospective clientele get to like and trust you. Recent posts on a blog show clearly that you are alive, kicking and open for business. If you're not convinced how a blog could benefit your business website, take a look at some of these examples. An acupuncturist’s blog (see the screenshot at the top of this post). It effectively gives a picture of the person behind the treatment as well of giving a lot of complementary information like recipes, what health coaching is about etc. The website design is effective as well, in general - it looks fun, and appealing. 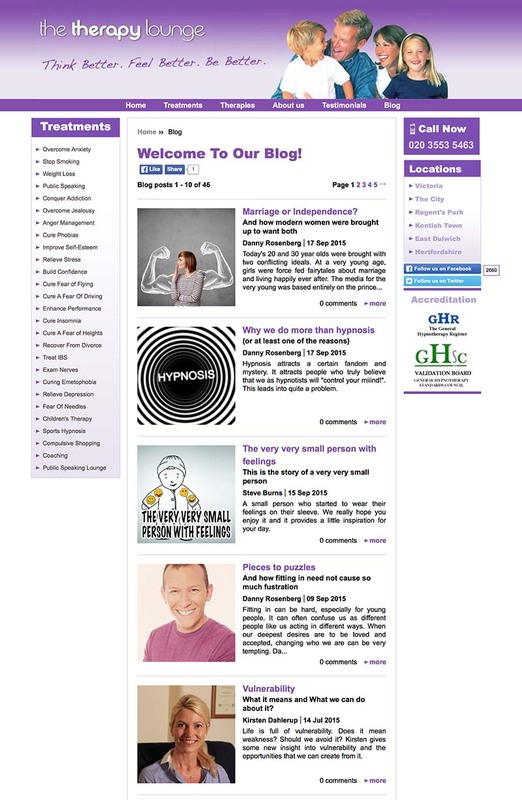 This is the example of a hypnotherapy website I mentioned above (see the screenshot below). The blog does a brilliant job in educating the readers, conveying the human element, and reassuring them with success stories. A dentistry blog attached to a dental surgery website. Yes, really. I’m willing to bet the frequent updates and relevant information do a great job in attracting clients. A financial services blog attached to a large pension company website, giving all kinds of useful and friendly advice to the readership. Even though the subject matter is serious, and treated in a serious manner, it makes the company seem more human, trustworthy and relatable-to, compared with competitors' websites, where there is no free, useful supporting information. Finally, two things to bear in mind when you're writing blogposts for your business website. 1. First of all, be sure who you are writing for. 2. Secondly, it doesn’t matter if you don’t write often. Just keep it regular. Once a month is ok if you can’t do more. But whatever you do, don’t abandon your blog - it sends out the opposite message to the one you want to send. I found quite a few good, but abandoned, blogs attached to service business websites when researching the examples for this post, which is a real shame, as the owners obviously started off with such good intentions. My final word that will hopefully encourage you is to remind you that a blog post needn't be long. It can just be a photograph with a few words explaining it, if this is what's easiest for you. Done regularly, it could be that this is all that you need to do to add the human touch and that extra interest to your business website, whatever field it is that you're in.